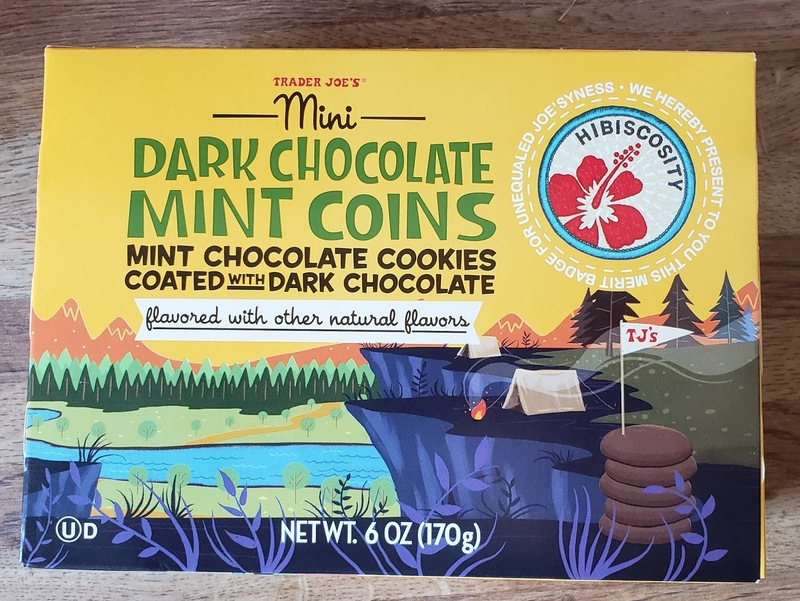 Is it okay to admit that I'm not fully understanding of the entire concept behind the new Trader Joe's Mini Dark Chocolate Mint Coins? 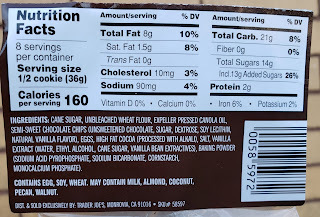 This much is easy to grasp: there's a direct, and fairly easy, comparison to be made between these cookies and the all time classic Girl Scout Thin Mints. 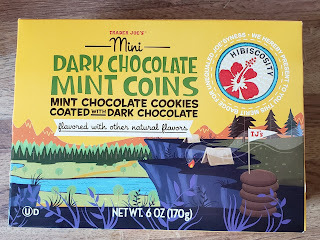 As if the "chocolate covered chocolate mint cookie" isn't obvious by its lonesome, the TJ's packaging hones in by showing a campground, tents, a sing-along campfire song on the side (because why not)...and even a cut out "hibiscosity" merit badge of sorts. That's cool and all, I get it. Seems like the word "coins" throws it all off though. Having never been a Girl Scout myself (and flaking out of Boy Scouts not long after making Tenderfoot class), I'm not aware of any connections between scouting and coins...I could be wrong and ignorant, and perhaps somewhat rationally so, but it seems a better name would be something like "badges" or "try-its" or even just plain "cookies." Although on the other hand, I do somewhat get the coin label, as the cookies are about quarter sized in diameter, and they were minted at point of origin...it's a bit too confusing. Ayy. Back to the Thin Mint deal. There's a lot of similarities between them and these TJ's chocolate mint discs, but I'll focus on the differences. First, the size. TJ's minty wafers are definitely smaller and perhaps a bit thicker. They also taste a little different...can I say "fudgier"? That's the word that comes to mind. It may be the darker variety of chocolate. 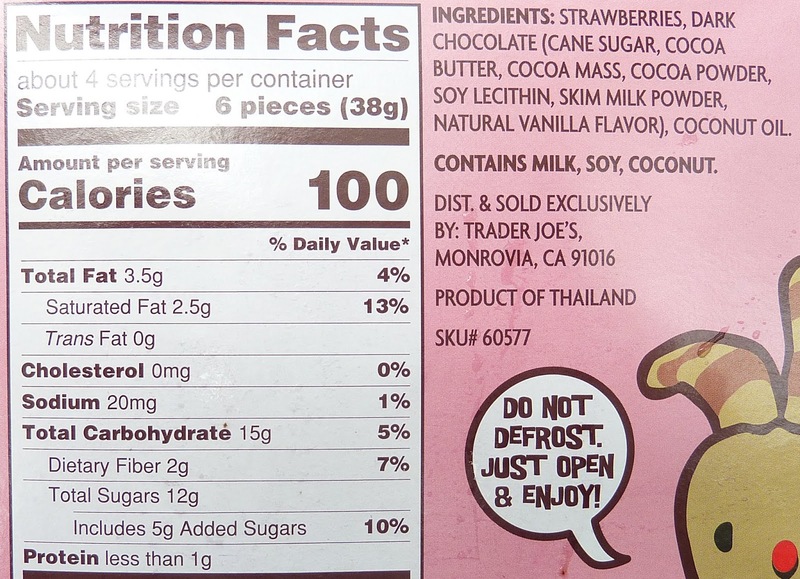 There's also seemingly a small dent/reservoir of extra chocolate in the middle of the TJ's cookies that adds a slightly richer element. So while I'd say the two are close, I wouldn't say they're completely identical. Although both are really good frozen, which is especially nice this time of year. One knock: the packaging. Inside the TJ's box, these cookies are kept in a little plastic bag, as one would expoect. Thing is, the bag looks only half full. Listen, I get the "sold by weight, not by volume" and "some settling may occur" but it's like these are fragile cookies that got smashed into bits, freeing up previously filled space. Nah...instead, whether fair or not, the half baggie of coins gives the perception of getting shortchanged. 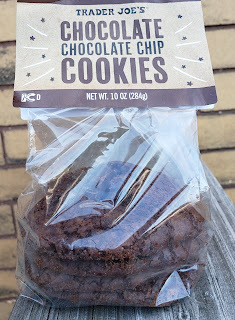 Regardless, these are pretty delicious cookies, as one would expect. At only a couple bucks, these coins won't set you back a lot of change. Glad to have scouted them out for you. We're just taking a brief break from food here and trying something different. If you like it, click the Facebook "like" button below and share the post with your friends. If you don't like it, click the Facebook "like" button below, share it with your friends, and leave a comment letting us know what a stupid idea it was. In all honesty, I'm very picky about mouthwash. I like Listerine—or more accurately, generic Listerine that comes from Dollar Tree. If it doesn't burn my mouth like crazy, I'm highly skeptical of its antiseptic and breath-freshening abilities. I'm not saying my breath wasn't minty after using Trader Joe's Mouth Wash. But it left an odd aftertaste long after I rinsed and brushed my teeth. The soap had a faintly sweet odor. I thought it was reminiscent of oatmeal soap with a hint of honey. It left Sonia's skin silky smooth. I didn't feel like it made much of a difference on mine. Another interesting property of the soap: it dried off very quickly. Other soaps remain slippery and slimy for a long while after being wet. This soap felt oddly drained just moments after being wet—still waxy and smooth, but with a complete lack of that slippery slime. For Sonia's thoughts, check out the short video below. Bottom line: Camel Milk Soap with Olive Oil and Honey: 7 out of 10. 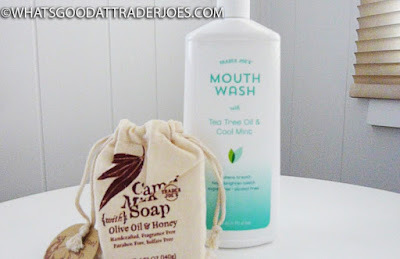 Bottom line: Mouth Wash with Tea Tree Oil & Cool Mint: 6 out of 10. So..anyone have an interesting story or anecdote or joke or anything about a peach tart? 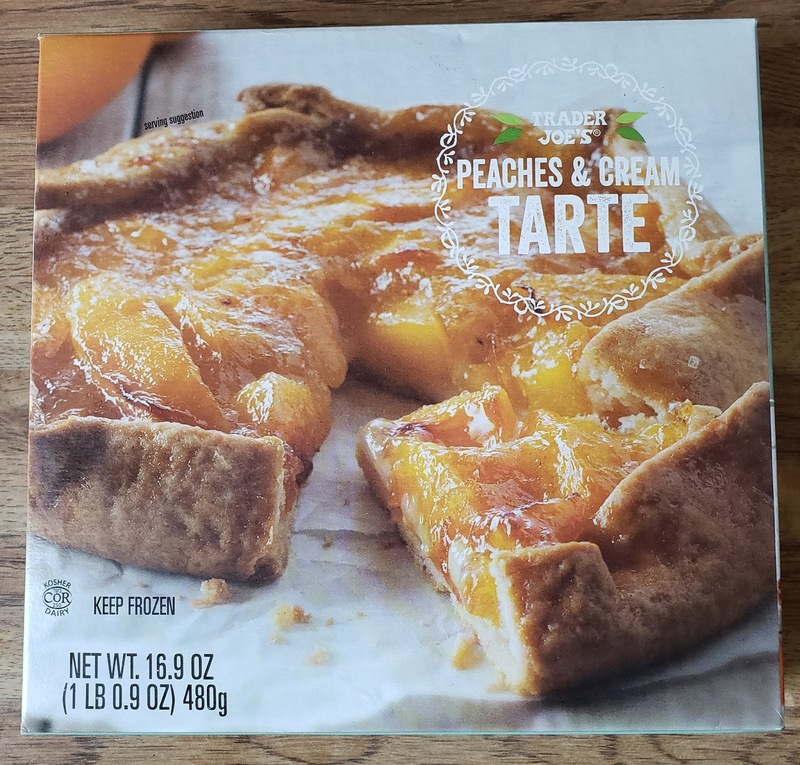 So that makes the kickoff of this review of Trader Joe's Peaches & Cream Tarte a little more difficult and less fun...until the Internet came to the rescue, yet again. Here I was, just brushing up on the differences between pies and tarts, when I came across this potentially interesting info burst: this tart (pardon moi, tarte) is really more a gallete than anything else. Rounded, kinda non-defined in form, fruit filled with crust folding over a bit and baked on a sheet? Yes to all of the above. Call it what it is, TJ's - this is a gallete. Aside from the inadvertant culinary education and cultural refinement, there's not much this peachy pie parodist really offers. I mean, it's okay and all. The crust seems the right amount of flaky and firm, the peaches won't be confused for picked fresh or canned, and the cream portion (if I can even call it that) is a bit underwhleming. 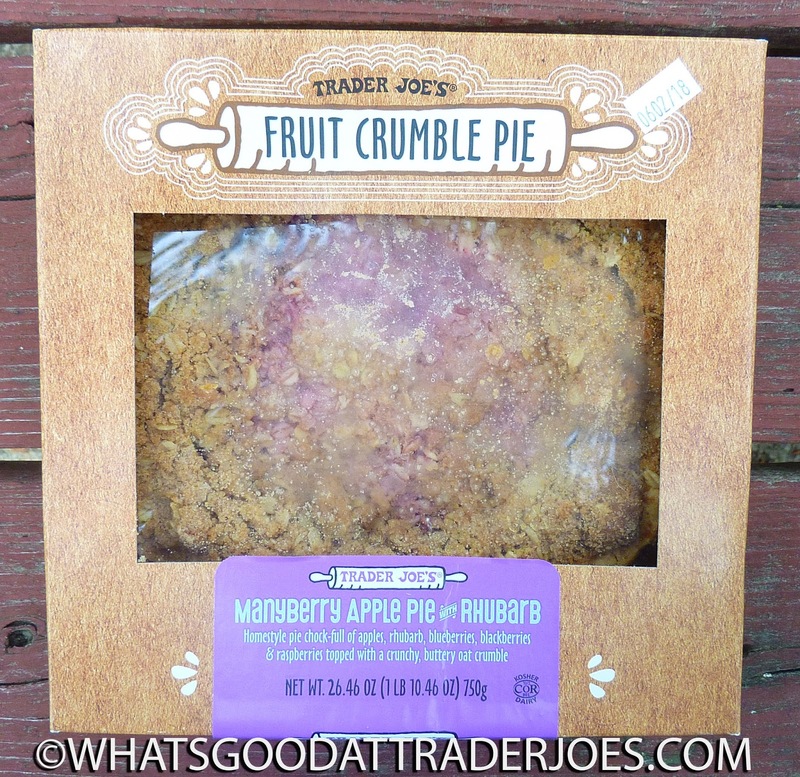 Sandy actually wondered aloud about the last part - really, it's just a thin spread between the fruit and crust, and it can be easily overlooked. 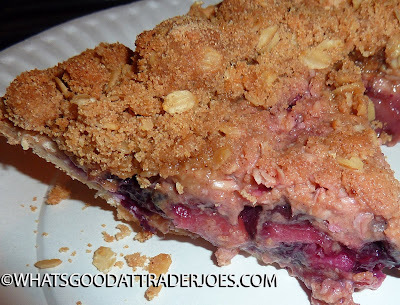 The fruit filling borders on a bit too syrupy sweet, though. I've had this weird lingering aftertaste for the past while after having a slice, and it's not entirely pleasant. Maybe it'd be dissipated if served with a little vanilla ice cream or something. It's the new PBJ that you put on your bread. No, not peanut butter & jelly. 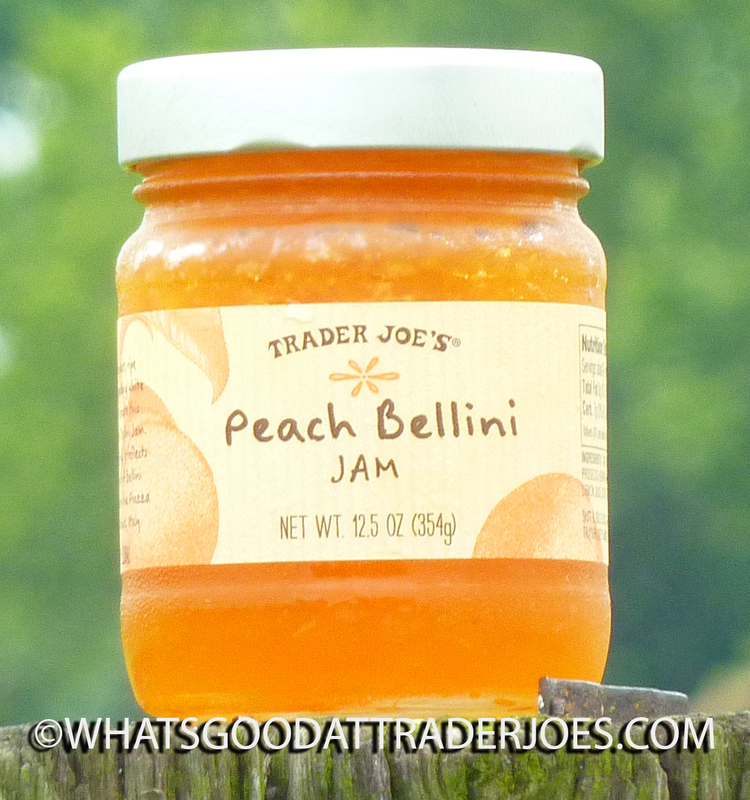 Peach Bellini Jam. As you might have heard in the recent Repeat Customer podcast episode, it has real Prosecco wine in it...you know, like an actual peach bellini cocktail. Sonia and I had a friend back in California that made a mean peach bellini drink, with real peaches and a nice peach wine. I don't think I've ever had one at a bar or restaurant or anything like that, but Jenny, if you're reading this, know that I miss those peach bellinis. 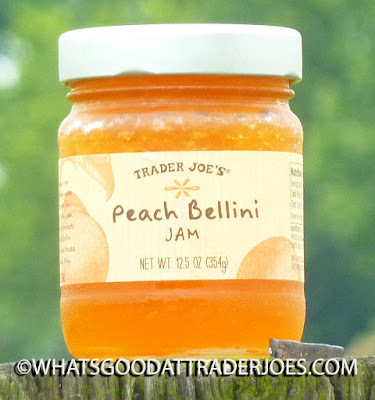 This jam is full of pureed peach bits, giving it a nice fruit base, but it's closer to the texture of marmalade than that of the similarly-packaged and marketed Apple Cider Jam. It's sweet like a real peach, but honestly, I was pretty surprised at the lack of cloying, syrupy stickiness. 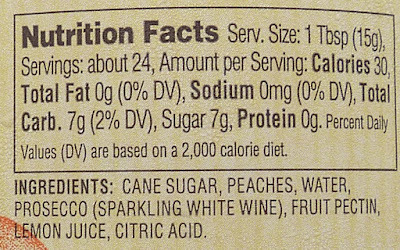 It takes some restraint to make something this well-balanced, relying on the true flavors of the peaches and the wine, rather than just dumping loads of sugar in the jar and appealing to a consumer's sugar habit. 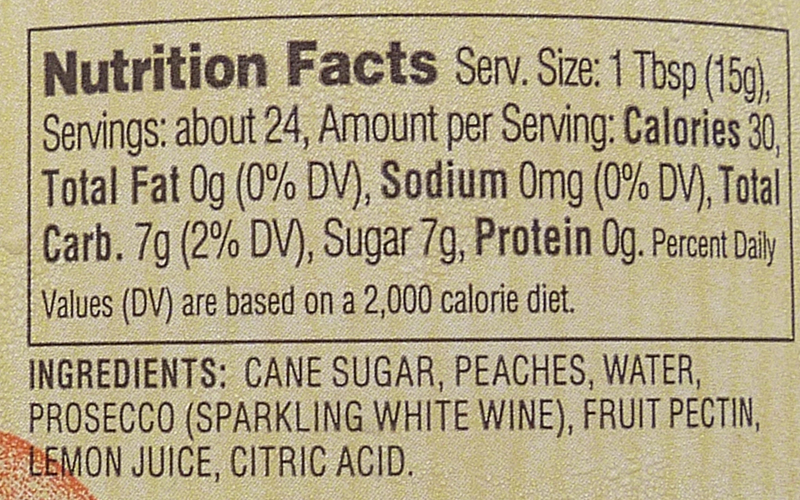 Don't get me wrong, cane sugar is the number one ingredient—but it's just exactly as sweet as it's supposed to be, IMHO. For you Puritans who steer clear of spirits, don't worry. There's just enough white wine flavor to be detected, but there's absolutely nothing to suggest even a hint of harsh alcohol taste in the product. 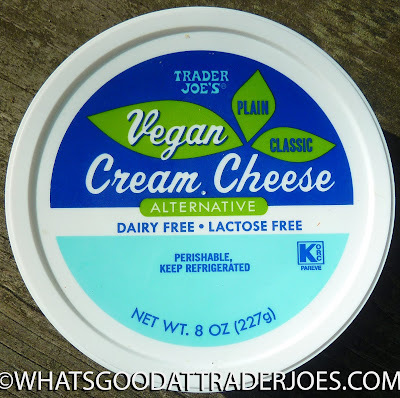 It goes well with butter and bread, and you could probably use it as an ice cream topping, smoothie ingredient, basting sauce, and Trader Joe's website even suggests drizzling it "on a salad of summer greens." Neither Sonia nor I have many complaints. I'm cheap, and I have trouble justifying the purchase of a gourmet condiment that will possibly be gone in just a day or two, but $3.99 is a very reasonable price for a product with such high-quality ingredients. You do get what you pay for. And this product is just peachy. Double fours on this one. As a friend of mine used to say as he exited the room, "It's time to make like jelly and JAM." I'm a guy, and aside from the bathroom paint job that's sat idle the past couple months, I don't do anything halfway, much less when it comes to one of the best things ever: food. I don't eat just half a burger. I don't drink just half a beer. I may on occasion eat only half a pizza, but that was mainly back in college. That hasn't happened for a while. And I don't drink just half a coffee, unless it's the tepid brownesque swill from the work pot. And I sure as heck don't eat just half a cookie. 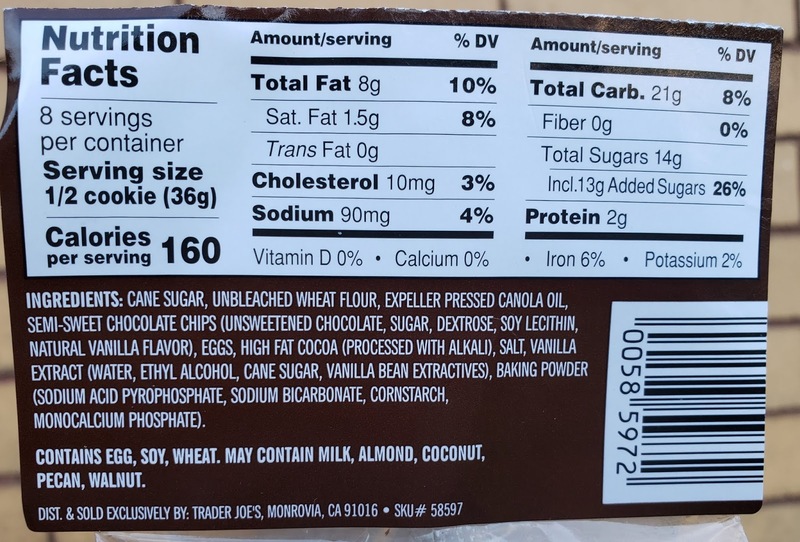 Unfortunately that's the serving size for a Trader Joe's Chocolate Chocolate Chip Cookie, and to doublr down on my woes, my lovely bride is the serving size enforcer. It says half, you get half. I had the indignity of having to share my cookie with her the other night, so tonight, right before writing this, when I had the chance to go whole cookie all by my bad self, I manned up and did it. "Like the corners from a brownie pan," Sandy said. Yes. That's almost precisely it. As one may expect, these cookies are atrocious for you. Gotta treat yo'self sometimes and after having salad for two meals, one of these didn't hurt too much from a caloric intake perspective. My taste buds begged to differ - by the last bite, it was enough. Not that I'd ever admit that, and if given the chance I'd eat another whole one...but if my wife or kids asked for a bite, I may choose, out of my grace, to not be so greedy as to keep the whole cookie for myself. Not too many negatives. Sandy wishes she could eat a whole one without feeling guilty, limitng her score to a 3.5. A couple bites I had tasted a little salty - not necessarily in an unwelcome way, but it was definitely a little uneven. The four pack cost around $4, so it was a mid-level value at best. I'll go with a 3.5 as well. Taste the rainbow, friends. Other than Skittles, this is probably the most colorful thing I've eaten in a while. Actually, I haven't had Skittles in years. This might be one of the most colorful things I've eaten period. 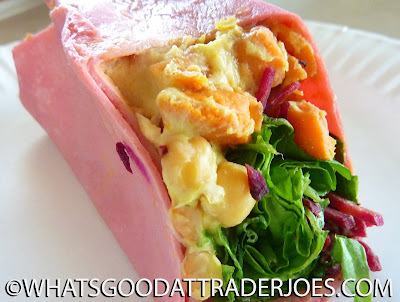 Let's see: we've got red beets, orange sweet potato, yellow hummus and chick peas, green spinach, and a purplish tortilla. What? No blue? No indigo? Whether Roy G. Biv approves or not, this is a great lunch for a hot summer day. It feels and tastes fresh, and it won't weigh you down too much. There are plenty of savory and earthy flavors here, and the sweet potato lends just enough natural sugar to keep it interesting. 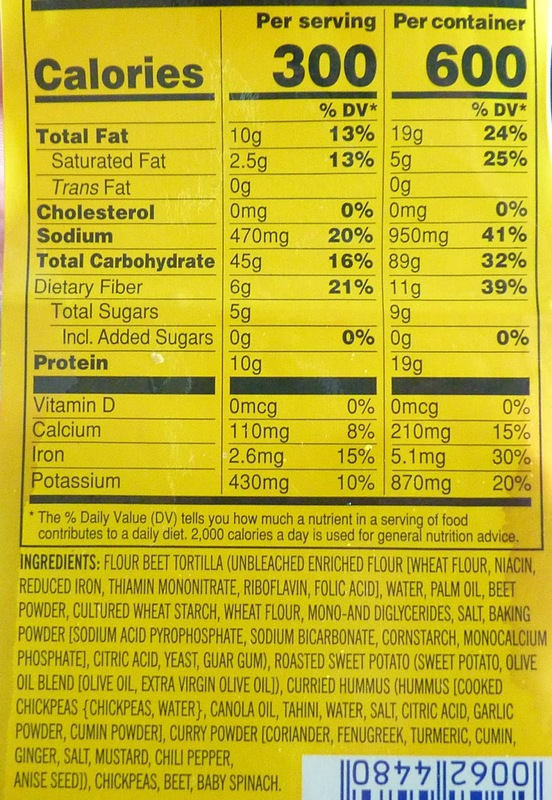 The beets weren't overly beety. They're not pickled, so they simply lend a bit of earthy crunch to the mix. The curried hummus was flavorful but not overbearing. The chick peas? I've mentioned how I feel about chick peas before. If anything, I'd just ask for more of 'em. Sonia wanted the sweet potato chunks to be just a tad softer than they were. They were much firmer than either of us expected, but unlike my loving wife, I was okay with it. They were somewhere between the texture of a water chestnut and that of a chunk of regular potato in a potato salad. 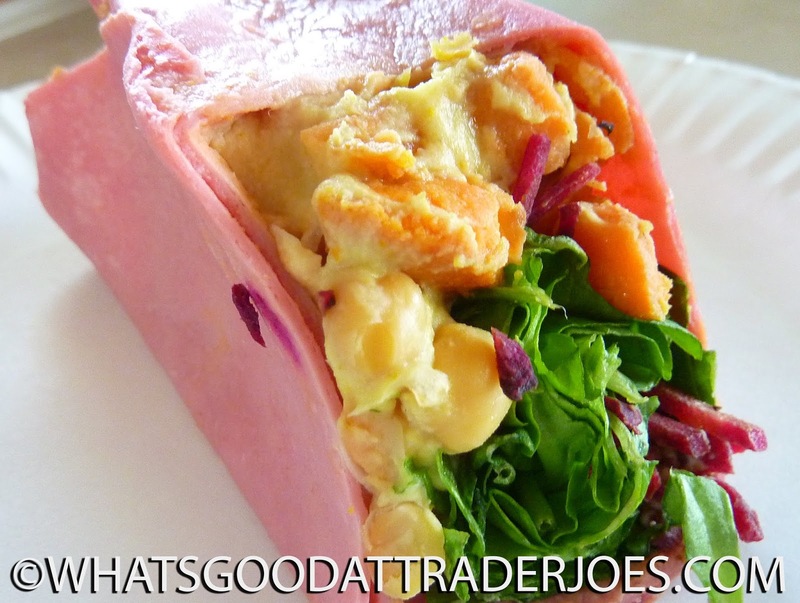 We both see why they might want them that way—the wrap may have seemed a tad "soggy" if the sweet potatoes had been too soft. As is, they provide a little body and texture, and contribute the most "meatiness" of any of the ingredients. 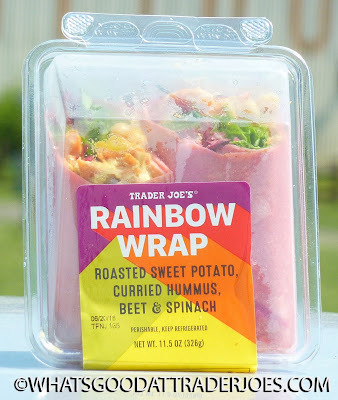 Granted, we had some other snacks along with it, but just this one wrap was enough for Sonia and I to share for lunch, and it was quite filling. 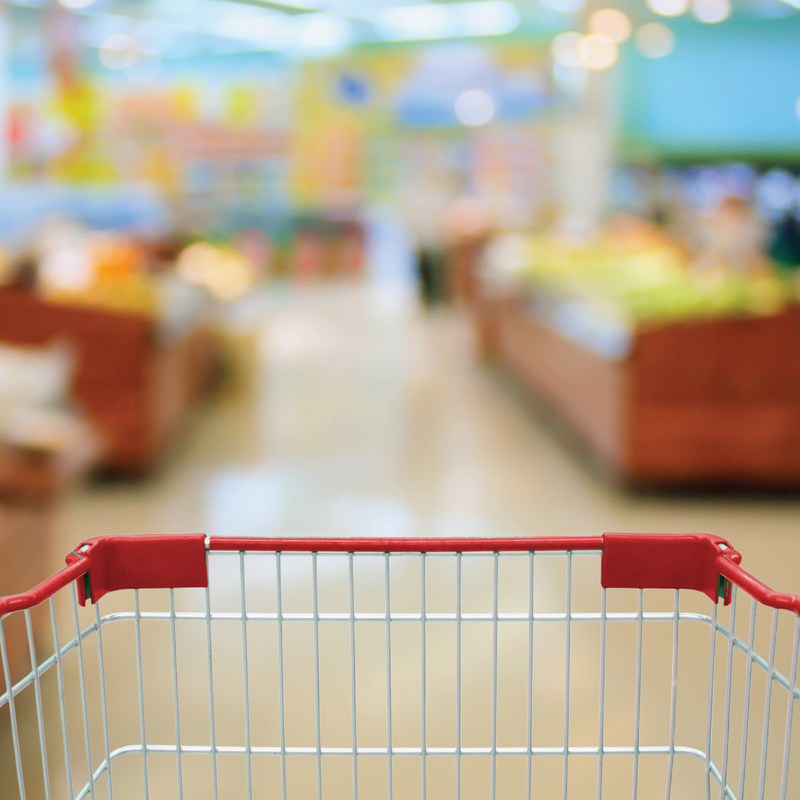 We're eating less and less meat these days, and feeling better about it all the time. 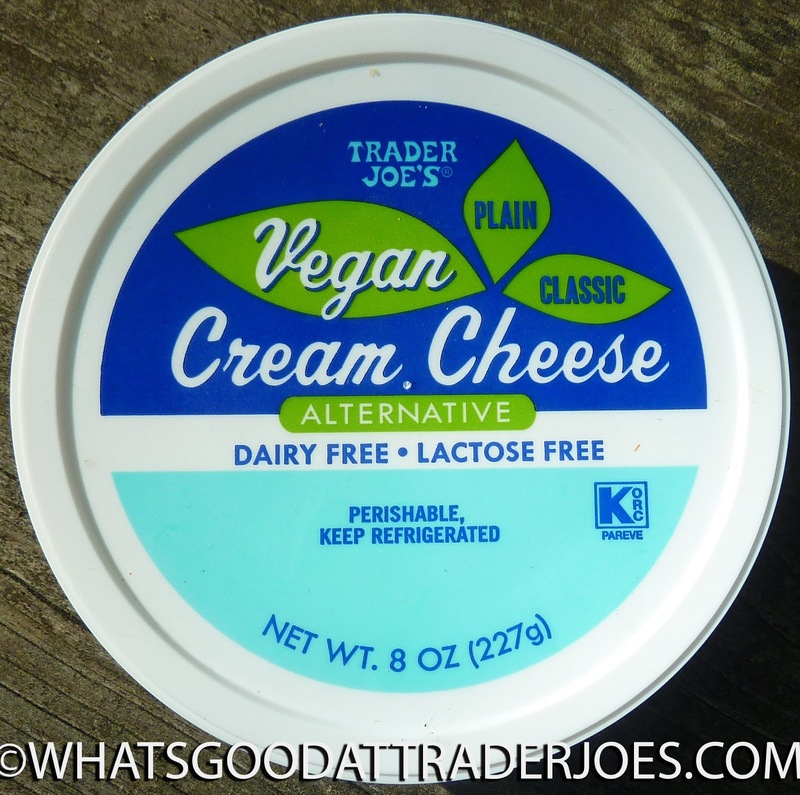 This vegan item is $4.49 at TJ's. Four stars a piece. A few weeks ago, our very own Russ and Sandy Shelly got to be guests on a brand new podcast called "Repeat Customer." They showed the podcast's host, Toronto-based Mio Adilman, around their local Pittsburgh TJ's—his very first visit to a Trader Joe's store. Also check out the podcast on iTunes and Zendesk! Must be butter because we're on a roll. Butter. What else can be said? Whether or not any of us really should, we all like butter in some way, shape or form. It's an essential ingredient, and makes almost anything taste better. I mean, dry toast? No thanks. Flavored butter? Even better. So here we go with two new varieties, Trader Joe's Roasted Garlic & Herb Butter Spread, as well as Trader Joe's Brown Sugar & Cinnamon Butter Spread. One savory, one sweet. Life is good. There's not much reinvention or novel interpretation here. It's butter...with stuff in it. But man, both are good. Let's start with the roasted garlic and herb. There's a heavy hit of garlic right upfront, as one would expect, with both roasted and crushed garlic puree mixed right in. The overall creaminess mellows it out, though, and gives way to onion and basil and whatnot. That's really about it to the butter, but the applications, of course, are endless. It's garlicky enough to McGyver garlic bread if toasted with an appropriate loaf. Over noodles, rice, veggies, anything else...yup, that'd all work. 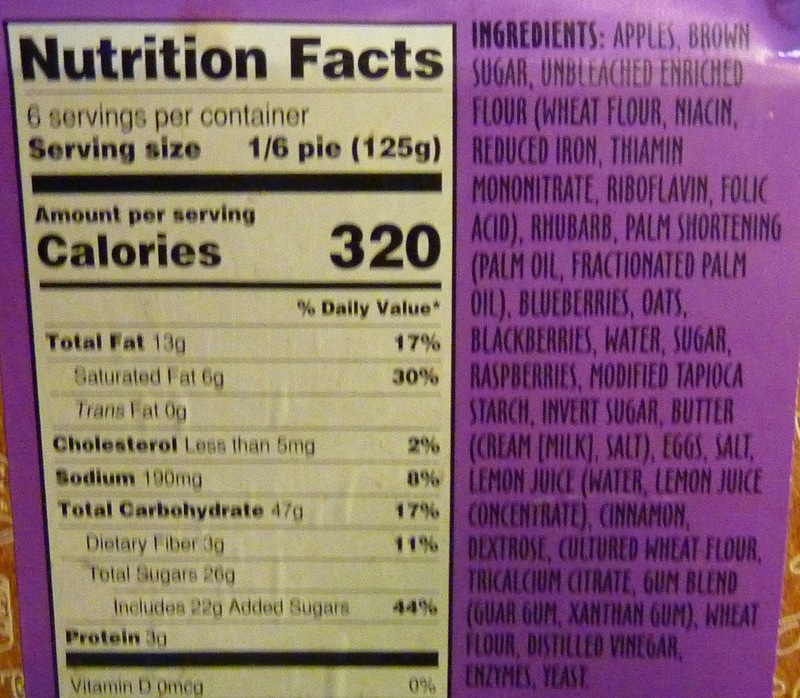 Much the same with the cinnamon sugar variety. 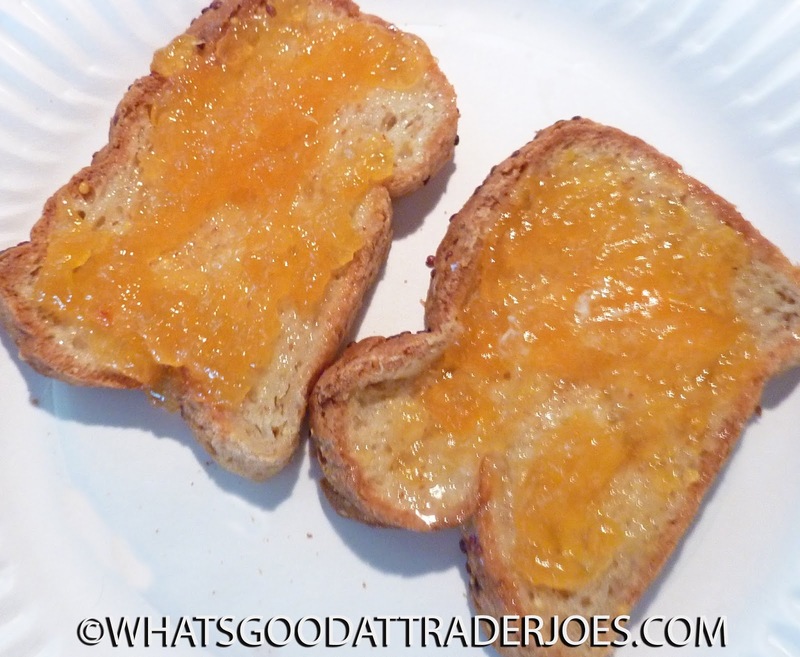 "Cinnamon toast without the effort!" Sandy exclaimed. I'm...not really sure what effort she is referencing. Nonetheless, that's a great idea, although the idea of melting over some sweet potatoes is a pretty enticing idea. I'd say there seems to be more cinnamon than brown sugar, at least in the bites I've had, but the balance seems right. I mean, butter, sugar, cinnamon...there's no way this can be bad. 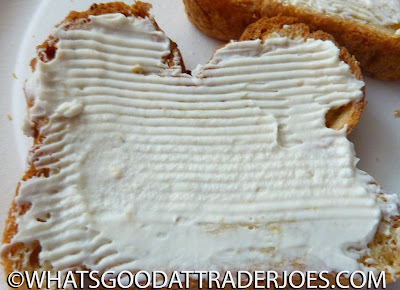 Both TJ's flavored butters are pretty decent, and for $2.49, not a bad price either. There's nothing too terribly extra special or "Trader Joe's-y" about them either, so I'm not going to rave too highly. Liking the ampersands in both product names, though - they seem to be making a comeback, and I fully support that effort. Fours all the way around for each. 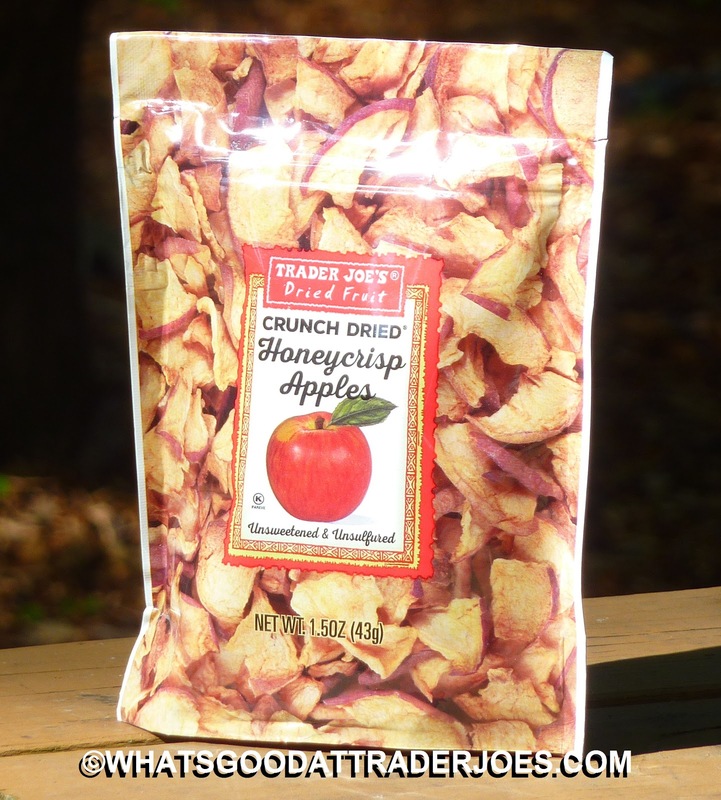 I've had apple chips before, but none have been as sweet or as flavorful as these. The Fuji Apple Slices received less than a stellar score here on the blog, but I think this honeycrisp variety might work slightly better for people craving something a little more sweet and a bit less tart. They flaunt the same delicious honey-esque flavor of a honeycrisp apple. Very little is lost in the drying process. Obviously they lack the juiciness of a real apple, but taste-wise, I think they're remarkably close. The largest apple slices were big enough to be called "chips," but as we neared the middle of our bag, the pieces were more like "shards" of apple. Toward the bottom, we found what I'd probably refer to as "bits" or "crumbs." They were pulverized, presumably in transit, to the point where they became difficult to eat. That's really my only complaint about this product: only the largest pieces could be called "slices" or "chips," and those were by far the best. 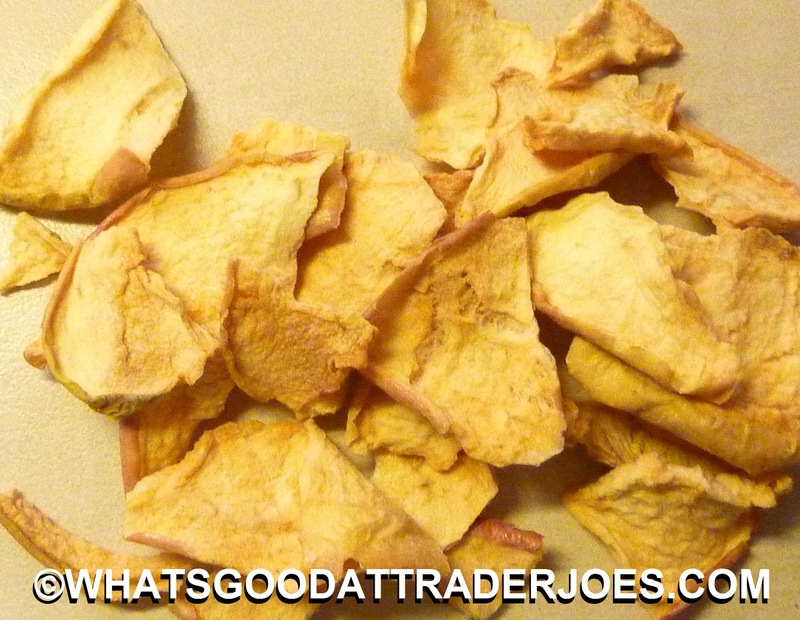 Pouring a bag of apple dust into your mouth isn't nearly as convenient as snacking on dried fruit chips. 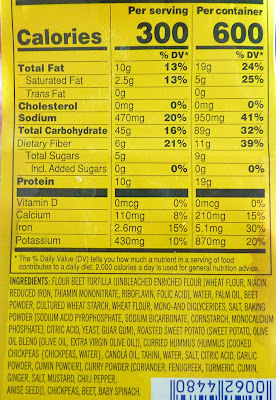 The texture is crunchy, crisp, and brittle. They're less rigid than, say, banana chips, but slightly firmer than other dried apple chips in my experience. Who says you have to wait for fall apple harvest to enjoy apples? I'm pretty sure this product was just released this spring. Even in light of the shattered pieces, I'd buy this bag of dried apples again since it's tasty and not particularly fattening. Also, the "Best By" date on our bag is October 24, 2020. Might not be a bad idea to stock up in case that long overdue zombie apocalypse finally occurs. Sorry, everyone...but apparently we're on a sugar high here. Nothing but desserty-esque goodness for review last week, and here we go again. It's a one way ticket to Diabeetusville here. Please see Wilfred Brimley for your box on your way out. One of these days we'll go back to reviewing salads and some healthyish type kinda stuff like vegan cream cheese alternatives...but not today. Not when there's Trader Joe's Peanut Butter Cartwheel Cookies to talk about. Give me peanut butter, or give me death. I'm a total complete junky. I could go all Hurley from "Lost" on a jarful at any time...and cookies? Forget about it. I'm helpless here. Really helps these are some most excellent pb cookies from TJ's. These particular cartwheely confections are unlike most peanut butter cookies I've had. Instead of just fork smashed flavored batter with or without chips, the approach here is a literal resorvoir of nutty goodness. I mean, look at the pic. Yummm. It's good peanut butter too, though perhaps admittedly perhaps a bit closer to JIF than the real high quality stuff. Then again, it's a cookie, and at least it's creamy and not too dry or anything of that sort. All of that is enveloped inside a real good, crumbly cookie. At first bite, I wasn't sure if the cookie straddled the sugar or shortbread side of the line at first before settling more towards sugar cookie. But it blends nicely with the peanut butter portion for a smooth, strong distinct pb taste. Therein may lie my only suggestion, as it's not a complaint, per se. But TJ's cartwheels seem perhaps a little "one note" if you know what I mean. Something small to add maybe a little texture distinction, like a smattering of chopped peanuts, would be a welcome addition. These will be a hit. Sandy and I are a bit sad that there's only nine cookies per box, as we both could smash them all in one sitting. As is, one of us will get five and the other four, assuming we can keep our kids out of them. Sharing cookies? Who does that? No one on this sugar train, for sure. Darn near perfect cookies. There's certain formulas for success that you just don't mess with. For example, almost all country music. It's solid, not spectacular, but when the mood is right, it works, at least for me. Kinda like a KitKat candy bar. Country music isn't my preferred genre by any stretch. On any list of favorite candy bars, I'm not sure KitKats would be anywhere in my top twenty or so. But when I got the right hankering, there's no questioning how good and right a KitKat is. Right snap. Right texture. Right amount of chocolate and crispy innards. Right amount of everything. It's enough that I kinda forget that KitKats are just chocolate covered wafers...until having a Trader Joe's Chocolate Coered Wafer Cookie and realizing how much unlike a KitKat they are. And unfortunately I don't mean it is a compliment. Never really occured to me that there'd be a right or a wrong way tmake such a simple confectionary concoction, but apparently so. These TJ choco-wafers, in comparison to KitKats, lack significantly. First off, there's so much less chocolate. Part of that is basic structure - the single snappable unitness of KitKats versus the solid TJ's slab - but part is also application. While KitKats have a respectably thick chocolate layer, these TJ cookie bars have such a thin layer I'd call it chocolate leaf. I mean, you can see the wafer through the chocolate. No bueno. 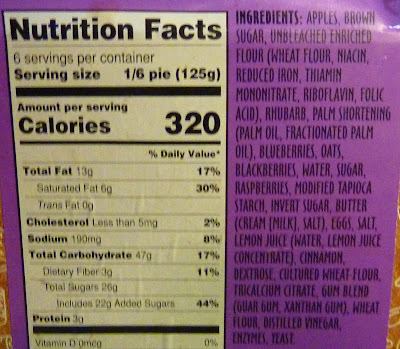 Maybe that's why the TJ chocolate wafers also feel a little different. It's like there's not the same snap. 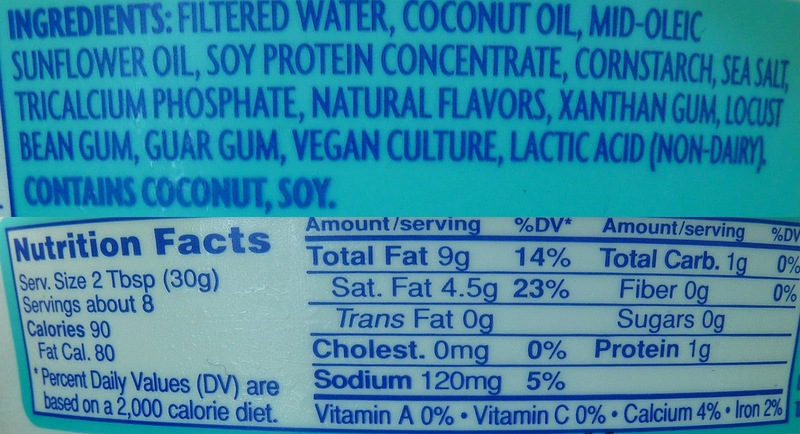 The wafer itself tastes all in all the same, but man...nah. It's off. Can't mess with the classics too much, I guess. Or at least you shouldn't. We're not big on these, and will probably never buy again. I think both Sandy and I are sparing a point each for there being sugar and chocolate but otherwise we have no enthusiasm for these KitKat wannabes. 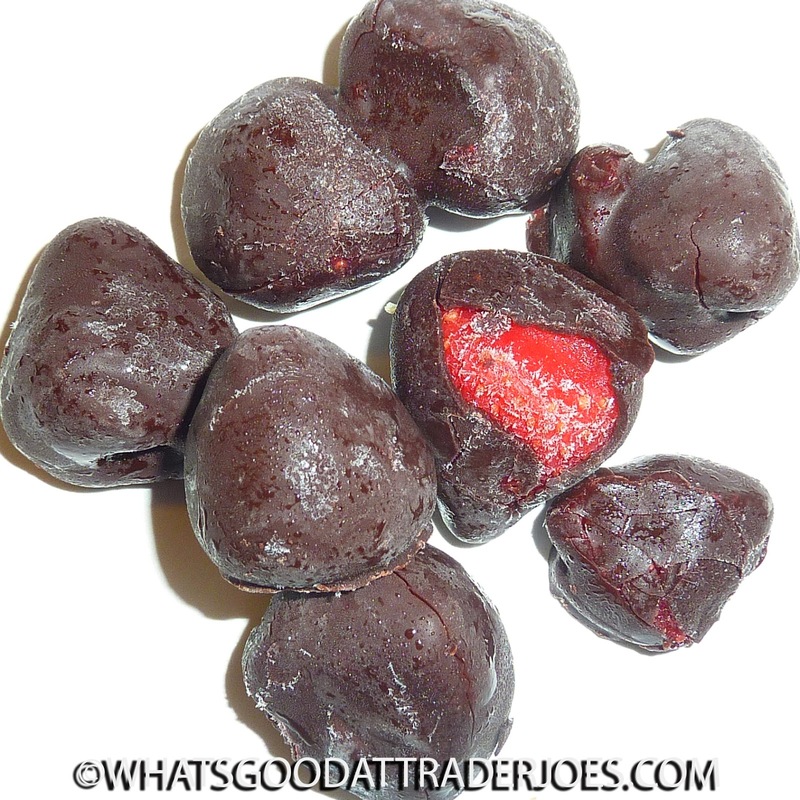 Ever had Shari's Berries? Delicious, right? They also cost an arm and a leg. I mean, sure, the presentation is fancy, and the berries are near-perfect, but they start at about $20 plus shipping and handling. Also, who wants to just sit and wait, fingers crossed, hoping that FedEx will actually get the address right and not just toss the package haphazardly onto the porch from the street? Not me, that's for sure. 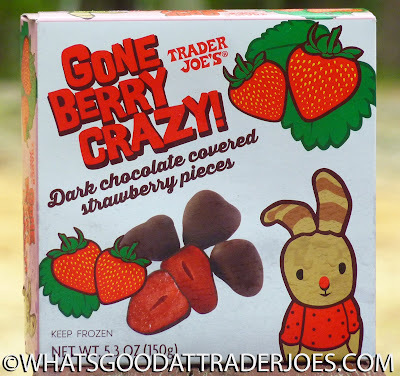 Now you can enjoy high-quality chocolate-covered strawberries for just $2.29 right from your neighborhood Trader Joe's. Heck yes. Remember Trader Joe's Gone Bananas!? Same concept, similar packaging, only with...you guessed it: strawberries instead of bananas. The berries come frozen, but they're in excellent condition, flaunting beautiful red hues, sweet strawberry taste, and the perfect amount of firmness. They're supposed to be served frozen, and we can testify that they're awesome that way—although just slightly thawed works just as well if you can wait that long to eat them. 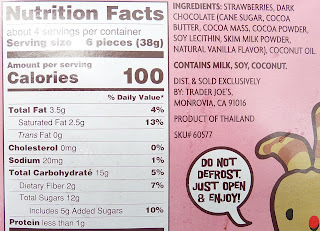 There are approximately two dozen strawberries in each box. Most of the berries are relatively small—about the size of the tip of my thumb—but we did find some size variation in each box. A few were quite large. 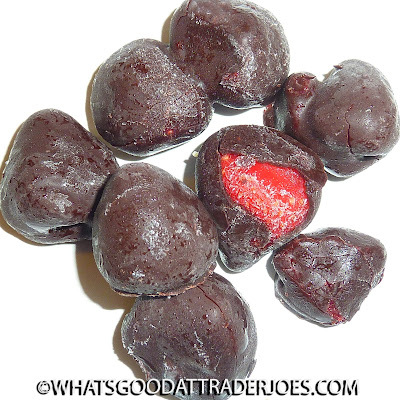 The outer layer of chocolate is fairly thin, but it's more than enough to balance out the taste of the strawberries. It's a dark chocolate, so it's not too sweet. Back in 2011, when Gone Bananas! were still new, I shared a story about Sonia and a toxic chocolate banana from a shady Southland street vendor. As a result, that product narrowly missed a shot at immortalization in our blog's elite Pantheon of great foods. My wife's never met a strawberry she didn't like. Five out of five stars from her. I absolutely loved this product, but in all honesty, I think I like the chocolate banana combo just slightly more than these. Still, I won't deny them the score they deserve: four and a half out of five from me.